There’s something about an old-school classic that warms the heart.That old Beatles record, that beautiful ’69 Mustang or the timeless black and white movie – there’s a reason why they stand the test of time – it’s because they were done right. True class lasts a lifetime. That’s how we feel about blackjack – the true classic of the casino world. The beautiful game of 21 – the inspiration for countless movies and tall tales since its inception – a true stalwart of the gambling industry. Classical Blackjack is untouchable, right? No one would mess with the rules, right? Consider this our public service announcement to all Australian punters. Be warned everyone, playing Blackjack in the flesh is not like you remembered. The game you love is under threat, but we know a place where it’s safe, unchanged and just how you like it. Each of our recommended online casinos listed in the table above has several different versions of blackjack, with high and low limit tables. Or, scroll down to read why blackjack has been ruined in Australian casinos. Let us paint a very real and very frustrating scenario for you. A scenario you can now avoid with the help of TopOnlineCasinoSites.com. You’ve wandered into a bricks and mortar casino in Australia and decided to throw down $100 on a blackjack table. After playing for a few hands, you sit on 18 and decide to let the dealer bust up. The dealer, taking two cards, duly obliges and is left on 22. You give your mate a high five – he’s hanging on your shoulder, doing that thing that all good mates do – hoping you win enough to shout him some drinks. It’s a staple, much-loved and much-used tool used by all cheap-skate friends. We love them anyway. The way blackjack has been played since the game was invented, in all casinos around the world, means that the dealer has lost the hand after going past 21 and you’ve won. I’m sorry my friends. Not any more. Not in Australia. The dealer explains that you’ve split the hand. You look at your friend in shock. What the hell is going on here? Is this Blackjack or not? In 2012, Melbourne’s Crown Casino, Sydney’s Star Casino and a large majority of smaller, boutique casinos around the country changed the rules for one of the most popular and famous table games in gambling history. On what they now call ‘Blackjack Plus’, if the dealer hits 22 – it’s not a bust. The hand is split. That’s right. Unfortunately, we’re not pulling your leg. 22 is not a bust in blackjack anymore. Not on Australian cash tables for your casual gambler. The whole point of blackjack – the 21 limit – has been ‘re-imagined’ by the powers that be and blackjack as we know it is now gone – its soul replaced by different rules that serve only to put the odds further in the house’s favour. But wait! If you love blackjack the way it used to be, there is a place you can play that is safe, completely legal and has the correct, traditional blackjack rules. Read enough? Sign up at Royal Vegas Online Casino and receive up to $1200 in free bets. How is playing Blackjack online better? Ladies, gentleman, punters… like most things in life, it’s all about the moolah. The better odds. The more cash. Online casinos may have a stigma attached, but the real truth of the situation is that you’re much better odds of winning playing blackjack at Royal Vegas than in the flesh. The stigma surrounding online gambling and specifically online Blackjack is gone. You want the facts to back up that statement? The true odds? Statistically, the return to players for the traditional, un-changed and honest blackjack is 99.66 per cent. A small house edge. These are the same odds you will receive at Royal Vegas. For Blackjack Plus, this new system that real-life casinos are now using, the return to players is 97.17 per cent. Now, that may not seem like a lot, but true blackjack players will know that dropping your odds by more than two and a half per cent each hand will cost you HUGE in the long run. Count in the complete frustration of having to split a hand when the dealer uses 22 and we shouldn’t need to convince you any further. 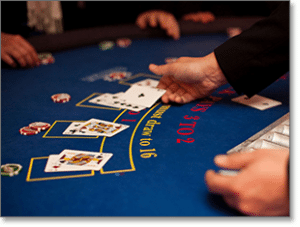 It’s time to sign up at Royal Vegas and safely play Blackjack the right way. Playing blackjack online is better because the odds are better. It’s better because you can take out the variables of other people’s bad decisions and it’s better because, most importantly, you’re a better chance at winning money. At the end of the day, we play blackjack because we enjoy it and also because, we can win some real money. Playing blackjack online is where you get to do that, hassle-free. What does eCOGRA-approved mean? Is it important? Every single casino recommended by CasinosOnline is given the seal of approval by eCOGRA. eCOGRA (e-Commerce and Online Gaming Regulation and Assurance) is the body behind keeping online casinos safe and secure for users around the world. If a website gets the eCOGRA tick, it means it has complied with a number of strict standards designed to uphold the integrity of the industry. eCOGRA has been in operation for more than a decade and is recognised globally as the leading watchdog for online casinos and making punters safe and comfortable gambling on the internet. What’s that you ask? What are some of the advantages of playing blackjack online? Besides the better odds? Besides the fairer play? Besides being able to play by the old, traditional rules? Playing online means playing whenever and more importantly, wherever, you like. 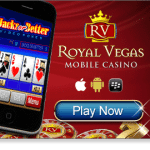 You can download your Royal Vegas app on your smart phone and log on at any time or place. Not only do you NOT have to play by the horrible, new 22 rules, but you can now avoid all the things that can ruin a real-life Blackjack experience – drunks making the wrong moves and ruining your hands, dealers messing things up or going too slowly or not having the simple chance to go one-on-one with the dealer. 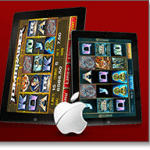 Royal Vegas also has instant play mobile casino and downloadable suite… you can play across all three platforms with your account. Live dealers? Real, in the actual flesh, dealers? If you so choose, you can log on and play with live dealers, using real decks, giving live results. Any misgivings you may have had about getting scammed online must be gone now, right? Did we mention that most of the time, the live Blackjack dealers at Royal Vegas are absolutely beautiful and stunning girls? Find out more about live Blackjack dealers right here. Playing blackjack online gives you an opportunity to really take your time and learn about the intricacies of the game. You’re in complete control – there’s no one hanging over your shoulder. The beauty of playing Blackjack at Royal Vegas is that you can work on your system and become a better player, away from prying eyes. Did we mention that when the dealer gets 22, she’ll bust too? In Australia, that’s now a privilege you will only find online. 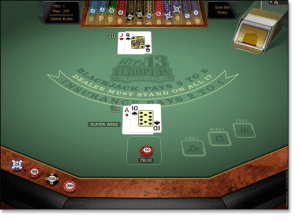 Blackjack rules, stats, systems and more information on how to play online can be found at your convenience right here. If you’re a casual punter and can’t afford to go to high roller’s rooms, the ONLY way you can play traditional blackjack is online. It’s as simple as that. 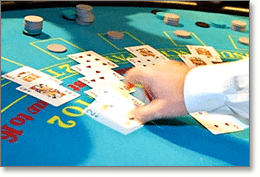 If you really love blackjack and want to play with the traditional rules, playing online is where you need to be. The best, fairest and most enjoyable Blackjack location we know? At the very top of the online casinos we recommend is RoyalVegas.com.au. Not only because it’s proven to be a safe and secure hangout over many years, but also because the odds are what you expect in each game. There is no changed rules to shift things even further in the house’s favour – you’re playing traditional blackjack with traditional rules. Love blackjack? Sick of the ridiculous rules that you’re dealing with at real casinos? Royal Vegas Online Casino is the place for you. Alternatively, our other top-rated blackjack sites are listed in the casino table at the top of this page – we recommend Raging Bull Casino as our top-rated casino site for players from United States, which has some excellent welcome bonuses available for new players along with a great range of blackjack variants, online slots and other table games.